Internal Communication Systems including: Public Address, Intercom, and Emergency Broadcast. Lighting including: NVIS, Floodlights, Emergency lights, signalling lamps and Divers lights. Link 11 & Link16 systems design, integration and maintenance. Antennas including: Radar, Communications, Countermeasures, Direction Finding, HF, VHF, UHF and IFF. Power Supplies, voltage regulators and Converters including: Radar Power supplies to 40 kV, Battery Chargers, DC to Single and Three Phase Inverters and Solid State Power Supplies. Phase Inverters and Solid State Power Supplies. Phase noise measurement to 40GHz. Recording Systems: Wide Band, Flight, Instrumentation, Analogue, Digital, MIL1553, SIGINT, CEPT1 & 2 & etc. 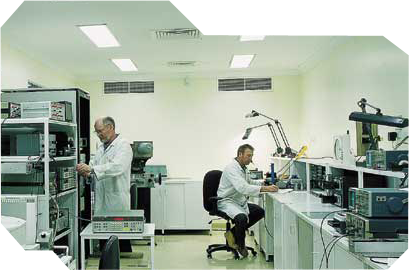 RF Communication Systems including: HF, VHF, UHF and SATCOM. Also MiniDAMA, WSK3 and URT23. Spectrum, Vector, Power, Frequency and Phase Noise measurement is available to 40GHz.